Intel, which traditionally has not been a major automotive supplier, has been expanding its presence in recent years. Intel Corp.’s proposed $14.7 billion acquisition of Mobileye will make the chipmaker one of the top players in computer processing for self-driving cars. The deal would allow Intel to challenge Qualcomm, the auto industry’s top producer of computer chips in the wake of its $47 billion acquisition last year of NXP Semiconductors. It also places Intel in direct competition with chipmaker Nvidia to supply the brains of a vehicle’s driver-assist and self-driving systems. Mobileye accounts for 70 percent of the global market for driver assist systems. The deal will keep Mobileye’s top management in place. The combined organization will be headquartered in Israel and led by Mobileye Chairman Amnon Shashua. Intel and Mobileye have already been working on multiple self-driving technology projects together. One such collaboration will debut this year when BMW rolls out a fleet of 40 self-driving 7-series sedans. Mobileye software will analyze sensor data to spot possible obstacles, and an Intel chip will decide how the vehicles should steer, accelerate or brake. Though commercialization of these fully-self driving projects may be a long way off, it’s likely Intel will look to capitalize on Mobileye’s current advanced driver assistance offerings. Virtually every major automaker buys Mobileye obstacle detection software for onboard cameras -- with the prominent exception of Toyota and Daimler. By focusing on ADAS, Intel and Mobileye can dominate a market that is quickly growing as demand increases for active safety systems. While other companies are looking to go straight to Level 4 and Level 5 self-driving systems -- which don’t require human intervention -- that will eventually make ADAS obsolete, these intermediate technologies could be a boon to Intel. And it won’t exclude it from holding a similar position in driverless systems. “Mobileye is, in the present, a big supplier in a market that is definitely going to grow and has a big presence in a market that could grow,” Ramsey said. The acquisition will also give Intel an advantage in the data storage and computing space. As part of the deal Intel and Mobileye will introduce crowd-sourced maps using data culled from vehicles next year. 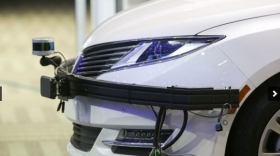 Vehicles equipped with Mobileye cameras and software will transmit data to the cloud. Intel will store and analyze the data, and German mapmaker HERE -- which is partially owned by Intel -- will generate the maps. Volkswagen and BMW already have signed up for the maps, which will be a key technology to help self-driving vehicles navigate construction zones, potholes and other road hazards. “We do see a place for ourselves in data storage and management,” said Kathy Winter, general manager of Intel’s automated driving division. According to IHS Markit analyst Akhilesh Kona, the Intel-Mobileye alliance will generate an estimated $10 billion in automotive revenue, up from $2 billion this year. With the 33 percent premium Intel is offering to acquire Mobileye, the deal shows just how far companies are willing to go to hold a stake in an increasingly competitive industry. And Mobileye’s nearly $15 billion price tag may help determine the value of potential acquisition targets, Ramsey said. Specifically, self-driving software companies will be especially attractive to companies looking to increase their presence in the space. What may end up being of most value, however, is real world experience. "Tech firms are hunting for ever more data. Miles = data. The world’s cars travel 10 trillion miles per year ... Who’s next?" Morgan Stanley analysts wrote in a report on Monday.